Posted on July 5, 2011 at 08:20. Most KVM Extenders transmit keyboard, video and mouse data over CAT5 cable, which is of course generally used for digital network applications. KVM Extender manufacturers choose this cable because it is cheap, readily available, and most industrial users are used to working with it. CAT5 cable is great stuff for all these reasons but has one significant shortcoming: it can be susceptible to EMI (ElectroMagnetic Interference) in electrically noisy environments. Fortunately for industrial users, CAT5 (or upgraded CAT5e or even CAT6) cable is available in a shielded variety, and with a properly designed KVM Extender this can greatly reduce problems with EMI. 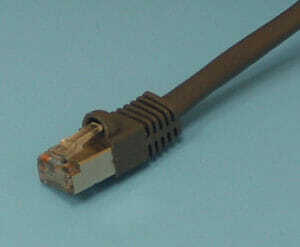 Shielded CAT5 cable is manufactured specifically to help minimize EMI in the cable. This cable is typically referred to as “STP,” or Shielded Twisted Pair. The shielding usually consists of a foil wrap in contact with a ground wire that will not allow stray voltages to be introduced to the transmission lines wrapped inside the outer foil. Keep in mind that in order to be effective, you must also use appropriate shielded RJ45 connectors that terminate the cable shielding on both ends and complete the grounding to the RJ45 jack in the KVM Extender device. While this seems like an easy solution, not all KVM Extenders are created equally. Some KVM Extender manufacturers do not recommend the use of shielded CAT5 cable since some image distortion can actually be caused by the shielding itself. These devices typically do not have grounded RJ45 jacks, which would be required to properly terminate a shielded CAT5 cable. Fortunately the AdderLink KVM Extender sold by Hope Industrial Systems properly terminates and handles shielded CAT5 cable, allowing the full benefit of these designs. The AdderLink extenders also provide manual image adjustments that allow the user to adjust out any image distortion that might be caused by manufacturing variation in some lower quality CAT5 cables. This gives the end user the best of both worlds: maximum protection against EMI by using shielded cable and the best image quality possible at lengths up to 300 meters.